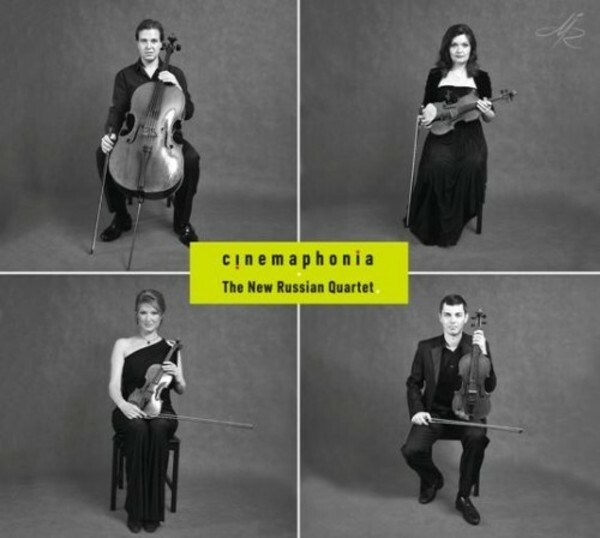 Melodiya Records presents an album of chamber music, 'Cinemaphonia', performed by the New Russian Quartet. The very concept of the album seems to provoke a 'decent' lover of music. A refined and 'intellectualized' genre of chamber quartet (Goethe compared a quartet to the �conversation of four sensible people�) and � cinema! Nevertheless, the quartet is again in demand in its original applied role in the 21st century (as background music at stand-up parties and elite receptions just as it was in the early 18th century), and quality cinema has frequently turned to string chamber music of both the present and the past to amplify the psycho-emotional effect. About half of the album is devoted to music of classical quartet works (Haydn, Mozart, Borodin, Jan�ček) which have been used in motion pictures in different years (Samuel Barber�s famous Adagio is particularly frequent � originally the slow part of String Quartet No.1). Also, there is Shostakovich�s Elegy, the composer�s first experience in the quartet genre, which later was used in his opera Katerina Izmailova. However, the main emphasis is on the quartet Moviemusic by Alexei Steblev, a cellist, composer and member of the New Russian Quartet. Compiled from the music to Avdotia Smirnova�s films Fathers and Sons (2008) and Two Days (2011), it is a self-sufficient cycle in the vein of academic tradition. The music was recorded in 2015 by the New Russian Quartet, one of today�s best Russian chamber ensembles, the members of which represent the domestic tradition of ensemble playing with dignity. �A fusion of a refined taste, depth and genuine sincerity of performance�, wrote the Kultura newspaper about the quartet.